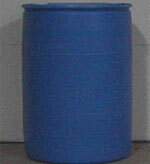 Plastic Barrels are typically used to store both hazardous and non-hazardous materials and liquid products. Youngstown Barrel & Drum Co. sells only the best barrels, made with the best materials in the industry. We believe in providing high-quality products at an affordable price. 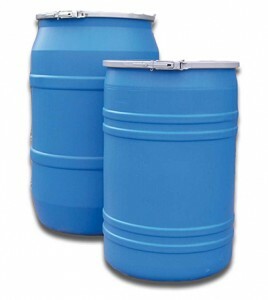 Our plastic blue barrels come in a variety of capacities, including 5 gallon, 15 gallon, 30 gallon, and 55 gallon plastic drums for sale. 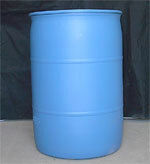 Our plastic barrels are durable enough that they can be used for indoor and outdoor needs. 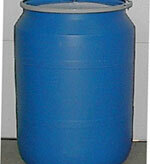 Our plastic barrels are resistant to corrosion and are made of polyethylene that resists dents. 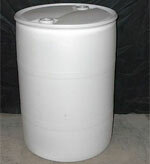 Our open top barrels for 30 gallon plastic drum can be specified to store up to about 395 pounds. 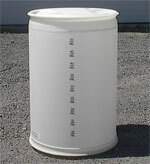 Our open top 55 gallon plastic drum can store up to 450 pounds. This is assuming that you are storing solids. 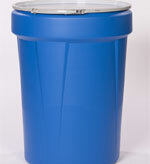 Included with our barrels are quick lock lids that will not pop when you are moving or transporting these barrels. 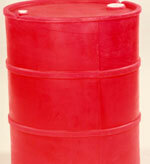 All of our closed top barrels have two openings that are used for pouring and ventilation. We recommend that when using our open head plastic barrels, in the case for the 30 and 55-gallon blue plastic barrels, you use a round bottom liner to help ensure compliance and to help better protect product quality. 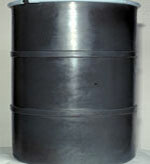 A round bottom liner is a seal mold liner that fits the shape of your drum. It is FDA compliant and can hold food items, powders, inks and even paint. Here at Youngstown Barrel & Drum Co., also have accessories used for barrels such as drum covers, drum recycling lids, and drum funnels. We also sell drum plug wrenches and drum openers. 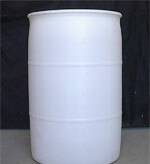 We are your one stop shop for all of your plastic barrel needs. For more information or to find the best steel drum supplier for your business call visit us at 1-800-359-DRUM. Dimensions: 23.50″ O.D. X 36.25″ O.H. Plastic 55 Gallon Open Head, OS-55, Plain Cover,Side Lever Lock Ring, Straight Side, UN 1H2/Y250/S, Blue, Wt. 23 Lbs. Interior Dimensions: 22.9″ I.H. X 36.8″ I.H. Dimensions: 23.3″ Dia. X 34.8″ Ht. Dimensions: 23.3″ Largest Outside Dia. X 35.2″ Ht.